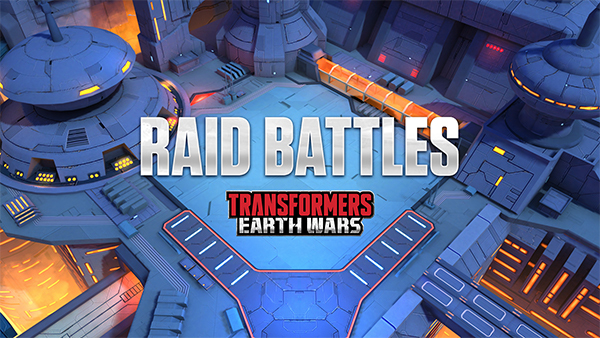 Alliance Raid Battles are a new alliance war mode where an entire alliance works together to overcome multiple strong raid bases to collect Raid Points and unlock rewards. Read on for an in-depth view of what Raid Battles are and how they work. Raid Bases are accessed through the Raid event menu. Selecting an available Raid Base starts an attack against that base. Raid Bases can be damaged or destroyed to score Raid Points that will unlock rewards. Raid Bases reward Experience Points per building destroyed but do not reward Energon or Alloy. Only 1 Alliance member can attack a Raid Base at a time. Once a base is selected, it is locked to that player, who then has 2 minutes to select the squad they want to bring into battle, and overall 10 minutes to finish the fight. 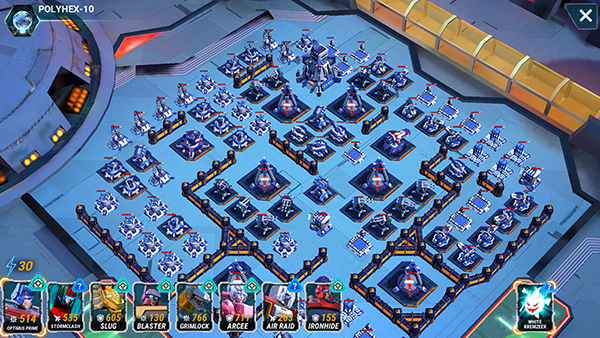 The timers are in place so that raid bases are not locked out for too long, but at the same time to give players who disconnect a chance to get back into the game and finish their battle. 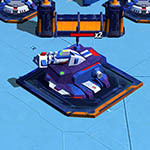 Energy Cells - Energy Cells are required to attack a base. The amount of Energy Cells required depends on the game mode and the event setup. Usually, a certain amount of cells are given at the start of an event and they replenish over time. During weekend events it is also possible to fight in event battles to gather more Energy Cells. Raid bases are not just any normal base - they are high powered, supercharged and rule-defying beasts with special buildings you will not have seen the likes of which before! There are twenty different raid bases with increasing difficulty that can show up in the events, but don’t have to. The below table lists them all in order. Please note that these values can change based on the type of event active. The number in the base names indicate how strong the base is. Most buildings will have a largely increased damage output and health pool. On many of them, you will notice a number next to their health bar, which indicates stacks of health bars! You will have to burn through all the stacks before a building is finally destroyed. Luxon Destabilizer - Fires a searing beam that deals more damage the longer it hits a target. Targets ground bots only. 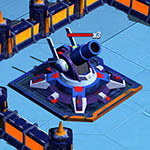 Railgun - Deals heavy damage to all targets in a line. Does not target flying bots. Acid Launcher - Fires an explosive shell that covers enemies in acid, slowing them and dealing damage over 5 seconds. Does not target flying bots. 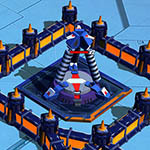 Thunder Tower - Blasts nearby bots with electricity, dealing massive damage and stunning them for 3 seconds. Immune to EMP effects! Does not target flying bots. 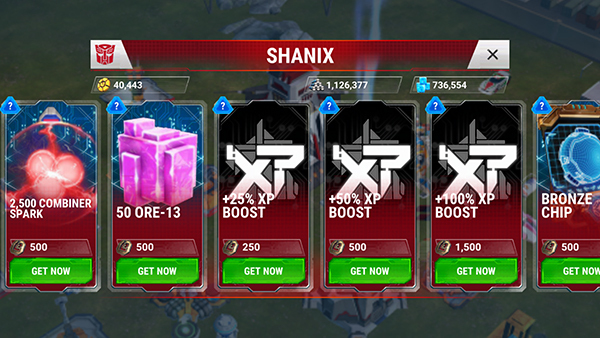 We launched the Raid Battles where you can win Shanix Coins and other rewards. Attempts are not limited: You can attack normal Event Battle Zones to get Energy Cells and use it to attack as many Raid Bases as you want. Mid-week Raid Events take place every Tuesday at 10:00 AM UTC to Thursday 10:00 AM UTC. In this mid-week mode, each alliance member will have limited attempts to damage Raid Bases as much as possible and you will get up to 1,000 Shanix Coins! Shanix is an unique currency used in Cybertron. And you can access to Shanix Store in the “Build” menu where you will be able to purchase some special items such as below. Watch these 3 videos of Ioannis giving you a few quick tips on making the most out of Raid Battles! PRO TIP PART1 - What are Raid Battles? - A quick overview of the new game mode. PRO TIP PART2 - Alliance Strategy: Learn some tips on how to tackle the Raid bases as an alliance. PRO TIP PART3 - Bot Strategy: Learn some tips on how to use specific bot abilities to your advantage in Raid Battles. Q: How can you attack Raid Bases? A: Energy cells are required to attack bases. You will be granted some Energy cells at the start of the event and Energy cells generate automatically over time. If you run out of Energy cells, you can obtain more by doing normal battles. Q: Can more than one player attack the same base at the same time? A: No, only one player can attack a base at a time and bases under attack will be locked down. Any destruction done to the base will be carried over and you will be able to see how much damage was dealt by certain members per base. Q: How many attacks we can attempt? Q: Can combiners attack the Raid Base? A: Yes, and you should definitely take advantage of their destructive force. Q: Do I need Fuel cells to participate on Alliance Raid Battle? 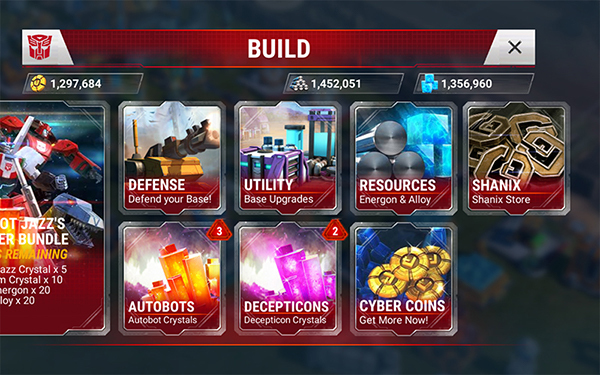 A: You will need Energy cells to attack Raid Battle bases which you can earn by winning in normal event battle zones. Q: Is there an Energy Cell cap? A: The Energy cells cap for the first weekend’s Raid event was 500 but this value might change for other Raid event. So once your Energy cell balance reaches to a cap, you won’t be able to obtain more by winning in event battle zones. Q: What will happen if I leave my alliance during the Alliance Raid Battles? A: Raid Battle weekend events behave exactly like Alliance Totalisers. If you leave your alliance, you will not be able to participate in raid battles anymore. Joining other alliances gives you access to their raid bases and you can help them, but if you already unlocked a reward from the totaliser in your previous alliance, you will not receive it a second time. Q: Will I win the exclusive prizes from the Alliance Raid Battles? A: Shanix Coin is a prize exclusive only to Raid Battles. Q: Will I gain the XP and medal from the Alliance Raid? A: You will gain a small amount of XP by destroying Raid bases but you won’t gain any medals. Q: Do alliance members who don't participate in Raid Battles still get Raid rewards? A: Yes. It works the same way as a normal totalizer event. Q: Will there be bot cooldowns during Raid Battles? A: Yes, same as other game modes. Q: Can we attack any Raid Bases or do we need to start from the first base? Q: If we don't battle the raid and save our Energy Cells, will they carry over to the next weekly Raid? A: No, they won’t carry over to the next event. Energy Cells reset after the event and will start with a new starting value the next time a Raid event starts.